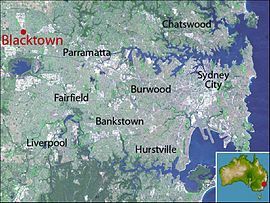 Blacktown is a suburb in the City of Blacktown, in Greater Western Sydney, in the state of New South Wales, Australia. Blacktown is located 34 kilometres west of the Sydney central business district. 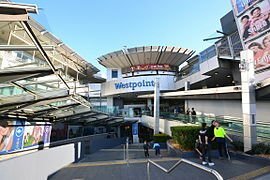 Blacktown is the largest of any suburb or township in New South Wales and is one of the most multicultural places in Sydney. Blacktown Township, 1886, subdivision plan. In 1804, the battle of Vinegar Hill was fought at Rouse Hill on 5 March. Convicts escaping from the Castle Hill barracks clashed with government troops under major George Johnson, declaring themselves to be for 'liberty or death'. The convicts were easily defeated and died in the battle. A few years later in 1823, the Native Institution (a school for Aboriginal children) was moved from Parramatta to the site where Richmond Road meets Rooty Hill Road North (this intersection is now in the suburbs of Oakhurst and Glendenning) which was named "The Blacks Town". The institution was then known as and it was synonymous with the stolen generation. Although the institution closed in 1833, the road heading out to the internment camp became known as the Black Town Road. In 1860 the Railway Department gave the name of Black Town Road Station to the railway station at the junction of the railway and the Black Town Road, with the name shortening to Blacktown by 1862. The arrival of the railway led to the formation of a town around the station. A post office was opened in 1862 and a school in 1877. In 1906, the Shire of Blacktown was formed and in 1930, electricity was introduced to the town. The population in 1933 was then around 13,000. In the 1950s and 1960s, there was a large amount of suburban development both in the current suburb of Blacktown and the new suburbs that sprung up around it. This led to civic development in the town centre with the hospital opening in 1965, the courthouse and police station in 1966, the library in 1967 and the TAFE college in 1969. In 1973, the Westpoint shopping centre opened which was soon followed by the cinema complex. According to the 2006 census, the most common way of getting to work from Blacktown was by car (74%) with public transport used by just under twenty percent. Most public transport was done by train (17%) with five percent catching buses for all or part of their journey. Blacktown railway station is on the North Shore, Northern & Western Line and the Cumberland Line of the Sydney Trains network. A major bus interchange is located next to the station and an underground bus station is at the entrance to Westpoint. Blacktown is a terminus of the North-West T-way. Busways provides services to Northern areas: (Rouse Hill, Castle Hill, Kellyville, Glenwood and Stanhope Gardens), West areas: (Mount Druitt, Plumpton, Oakhurst, Quakers Hill, Dean Park, Woodcroft) and South districts (Prospect, Arndell Park, Huntingwood, Tallawong, Doonside, Blacktown Hospital), whilst Hillsbus provides services: Eastern services (Macquarie Park, Seven Hills, Parramatta, Kings Langley) of Blacktown. The first school, a single-storey brick building with gables, was opened in 1877. While no longer in use as a school, the building in Flushcombe Road is now used as a Visitor Information Centre. 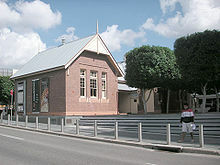 It is the oldest remaining building in the Blacktown CBD and is heritage-listed. There are a large number of schools in the suburb. Government-run primary schools in the area include: Blacktown North Public School, Blacktown South Public School, Blacktown West Public School, Lynwood Park Public School, Marayong South Public School, Shelley Public School, and Walters Road Public School. Public high schools include: Blacktown Boys High School, Blacktown Girls High School, Evans High School and Mitchell High School. There is also the Coreen School, which caters to older children with learning difficulties. The centre opened to the public in October 2002. In 2006 the centre underwent a multimillion-dollar refit and extension. The building reopened in April 2007 with facilities for performance, extended visual art galleries, workshop space and enhanced administrative areas. Blacktown is served by local newspaper Blacktown Advocate and community radio station SWR Triple 9. Thy Art Is Murder, a deathcore band formed in 2006.
, vocalist for deathcore band Thy Art Is Murder. The Radiators, A pub rock pop band formed in 1978. ^ a b Australian Bureau of Statistics (27 June 2017). "Blacktown (State Suburb)". 2016 Census QuickStats. Retrieved 7 August 2017. ^ a b c "Important dates". Blacktown City Council. Archived from the original on 6 May 2008. Retrieved 16 May 2008. ^ "Aborigines". Blacktown City Council. Archived from the original on 6 May 2008. Retrieved 16 May 2008. ^ "Lowy's Big Night". Blacktown Advocate. News Community Media. 11 February 2009. pp. Wrapround. ^ "2006 Census Community Profile Series : Blacktown (State Suburb)". Australian Bureau of Statistics. Retrieved 2008-07-29. ^ "Blacktown Primary School (former) - NSW Environment & Heritage". ^ "Coreen School". NSW Department of Education & Training. Retrieved 2008-05-15. ^ "Nagle College". Nagle College. Archived from the original on 19 July 2008. Retrieved 15 May 2008. 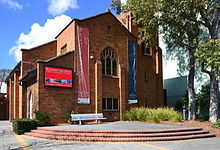 ^ "Patrician Brothers Blacktown". Patrician Brothers Blacktown. Retrieved 2008-05-15. ^ "Tyndale Christian School". Tyndale Christian School. Archived from the original on 8 May 2008. Retrieved 15 May 2008. ^ "Western Sydney Parklands | Bungarribee". www.westernsydneyparklands.com.au. Retrieved 2017-05-09.